Would the next app respond to needs in the education, health or agricultural sectors? Are we going to approach app development from a service provision perspective or from an ‘interesting app’ perspective? Is there an incentive to develop apps for a very large segment of the population that is also at or below the poverty line? How do you engage with mobile operators? How do you identify and engage users? Can technology connect people with and without mobile phones? Can people without mobile phones access the same services and data as people with mobile phones? Regardless of the sector where apps would be developed, it was generally agreed that while the technology would be simple, the business model would be a big challenge. It was suggested that public private partnerships would go a long way in ameliorating some business model related challenges. Indeed, the success of mPrep Kenya is a result of co-designing with educators and organizations in the education space. Strategic partnerships can improve the business model; mPrep partnered with Safaricom to reduce their SMS charges by 80% while generating more volume for the telecom with their scaled education services. Mpesa’s exponential growth is a result of value added services. It remains successful in Kenya because regulation was not able to hinder its growth. The policy approach to help develop the app ecosystem and provision of services should be guided by users needs, and not developers, who despite elaborate market research, may still not be well versed on the needs of end users. In their book ‘Reverse Innovation‘, Vijay Govindarajan and Chris Timble found that the needs of one person with $10 are different from the needs of 10 people with $1. In light of this, there were many comments on whether developers and hardware manufacturers had the incentive to develop and manufacture for a high volume but low-income group. Another example of a large-scale effort to bring a better platform for apps is the partnership between Huawei and Microsoft to develop a “4Afrika” phone that will cost a little under Kshs 10,000. Keeping in mind the development platform, although most people globally have feature phones now, it’s only a matter of time until the smart phone is more common and that will greatly improve the build and demand for apps. Engaging mobile operators was mentioned as a significant challenge. Facebooks zero model, zero.facebook.com, was mentioned as a successful example of partnering with mobile operators to bring a service to large numbers. In Tunisia, Morocco and Ghana, three operators have launched the service. While there has not yet been a transition from zero to paid data, the hope is that after people become used to the zero model, they can start paying for services. Facebook’s success works because of its scale. Operators generally do not have business models or platforms that help local developers. Indeed, the companies that provide technology to mobile operators would rather offer in-house services or scaled apps that drive volume rather than spend efforts to nurture low volume, local developers. Bottom of the Pyramid (BOP) users in Kenya have disparate needs and for developers there are multiple challenges to meet those needs in the appropriate language and use case. 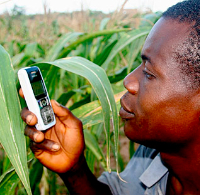 Researchers at the University of Nairobi and Standard University have build an app using a mobile web platform that helps people diagnose agricultural pests and crop diseases using interactive voice response. They did a significant amount of research and engaged with end users to ensure the service would be easy to use. Some additional scale could be achieved by further engagement with community knowledge workers: educationists, agricultural extension officers and health workers but the service has a natural upper limit of users in niche agricultural markets. The discussion wrapped up acknowledging that some apps serve important but narrow development needs that – on their own – have limited scalability. And that the “next big app”, the next stage in tech for development in East Africa, would be a more mature development ecosystem that can nurture diverse user needs. As development takes root, the ecosystem matures and a wider range of services become possible.